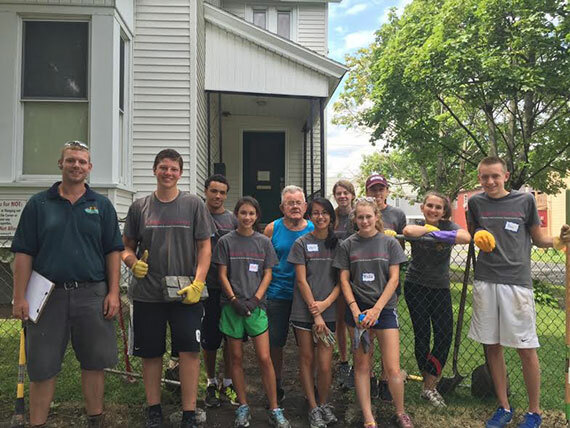 Students pitched in to help Utica residents as part of a first-year pre-orientation program. The news has been inundated with stories about refugees — in the United States and abroad. With a burgeoning refugee community in Utica (approximately one-fourth of the population is made up of refugee families), which is located less than 30 miles from the Colgate campus, students and professors are finding ways to help. Also through COVE, members of the Class of 2019 got an early start on service learning with a pre-orientation program. In the days leading up to first-year orientation, eight volunteers teamed up to work with the Johnson Park Center in the Cornhill neighborhood, which is one of the city’s poorest and where many refugees live. They removed a broken part of the sidewalk in front of a resident’s house, and then laid down new stones. “It was hard work, but all of the volunteers were excited about it, and it was very rewarding to see the finished product,” said Maia Dinsmore ’17, a COVE leader. Professors get involved, too: COVE also oversees a service-learning course-development grant program with the dean of the faculty office. Supported by the program, faculty members develop a service learning component for a class. The first recipient was Ryan Solomon, assistant professor in writing and rhetoric. He redesigned his CORE South Africa class to include work at the Somali Center, and students from his class went to South Africa for six weeks this summer.